Ragdoll Kittens Personal Checks feature 4 portraits of these adorable and cuddly kittens. Ragdolls are characterized by their blue eyes and colorpoint coats (meaning their extremities are a darker color than the rest of their coat). They got their name because the original breeding stock often went limp when someone picked them up, thus they were like rag dolls. 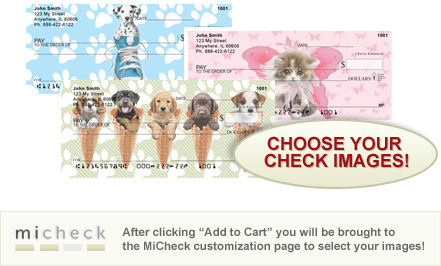 Ragdoll Kittens Personal Checks are available in single and duplicate check formats. Matching labels and checkbook cover are available.